The crucible that is the #HIMSS18 exhibit hall is over. 1300+ vendors have taken down their booths and rushed off to catch flights home. In the quiet aftermath of the vendor exodus, I had the chance to reflect on the overall themes of this year’s exhibits. 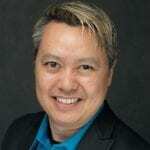 Yet after speaking with many vendors, it became apparent to me that the term was being used very broadly to include: machine learning, data mining and rules-based workflow. Worse, a few vendors I spoke to were unable to describe how the addition of AI made their products incrementally better than what they offered before. Will “AI” go the way of neural networks, hydrogen cars and 3D TV? Doubtful, but it is concerning how quickly the term has become a marketing buzzword. In years past, you couldn’t walk down the aisles at HIMSS without vendors handing you nicely printed marketing brochures. This year, there was a noticeable lack of brochures. Several vendors had no paper handouts whatsoever, electing instead to email materials directly to booth visitors rather than force bulky paper brochures into their hands. In my mind this is a win-win-win. The environment wins because fewer trees are transformed into glossy brochures with smiling doctors staring at computer screens. HIMSS attendees win from not having to carry heavy brochures. HIMSS exhibitors win from not having to print and ship brochures. One of the staples of HIMSS has been the amazing promotional items given out by vendors in the exhibit hall. This year, however, vendors scaled back their giveaways, opting instead to invest more on in-booth experiences. I counted no fewer than 20 podcasting stations and 15 video/livestream setups embedded in vendor booths. The soundproof podcast studio in the Cerner booth was amazing. Also notable were the number of in-booth theatres that dotted the exhibit floor. I stopped counting after reaching 250. What impressed me was that it was not just sales presentations that were happening on these stages. Many vendors featured panel discussions and live interviews of industry thought leaders as part of their programs. 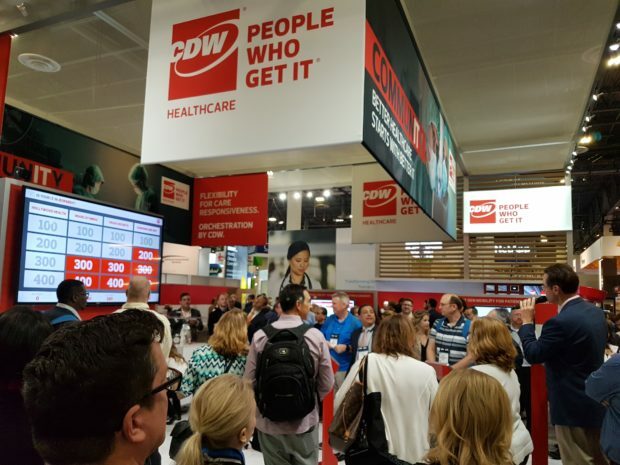 In my mind the hands-down winner was the CDW Healthcare Jeopardy station. Every day there was a crowd of people actively participating in a game-show style contest that pitted up to 6 teams of participants against each other. The show host was particularly charming and engaging. He really got the crowd excited. Bonus: the questions were all healthcare based. Special shout out to @MedicaSoftLCC @FogoDataCenters @NextGate @emedapps for gathering donations for SafeNest an organization that helps victims of domestic abuse in Las Vegas. It’s one thing to hire an entertainer like a magician or look-alike to attract people to your booth. It’s quite another to hire an attractive model to do nothing more than to stand in your booth and be attractive. At HIMSS18 I noticed very few of these hired helpers. There were certainly models who were hired to play the part of a patient in mock exam rooms, but there were no scantily-clad flamingo girls or bare-chested tuxedo men handing out company brochures like in years past when HIMSS was in Las Vegas. I’m hoping this downward trend continues. The most surprising aspect of the HIMSS18 exhibit floor was size of the booths themselves. There were the usual giant footprints from industry titans: Epic, Cerner, Allscripts and IBM Healthcare. But other than the new Change Health booth, it felt like most vendors chose smaller booth sizes. 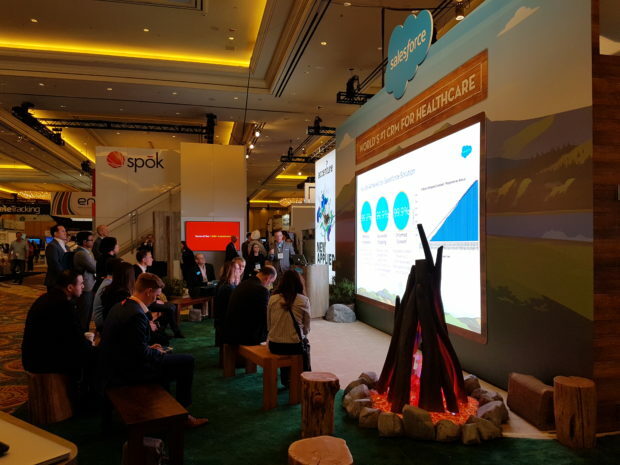 Salesforce, Oracle, Microsoft, Google, Amazon, DellEMC and Verizon had moderately-sized booths at HIMSS18 relative to the size of those companies.